Abu Dhabi is not really my kind of town – I like cities made for people, not cars. But after two visits I will concede that it has some nice spots if you look hard enough, plus the stunning Grand Mosque which I would happily visit every day for the rest of my life. A titchy little gallery tucked away near a supermarket about 20 minutes walk down Al Bateen Street to the Corniche, I liked this place. When I visited it had a junior T-Rex skeleton on display downstairs, next to some local modern art about matchsticks – a kind of up-market version of a small-town museum. But upstairs there were some really great exhibitions. My favourite was a collection by Yiannis Roussakis, included a quartet of paintings depicting the Madinat Zayed street market (below), and a lovely camel portrait, ‘I’m Calling You’. 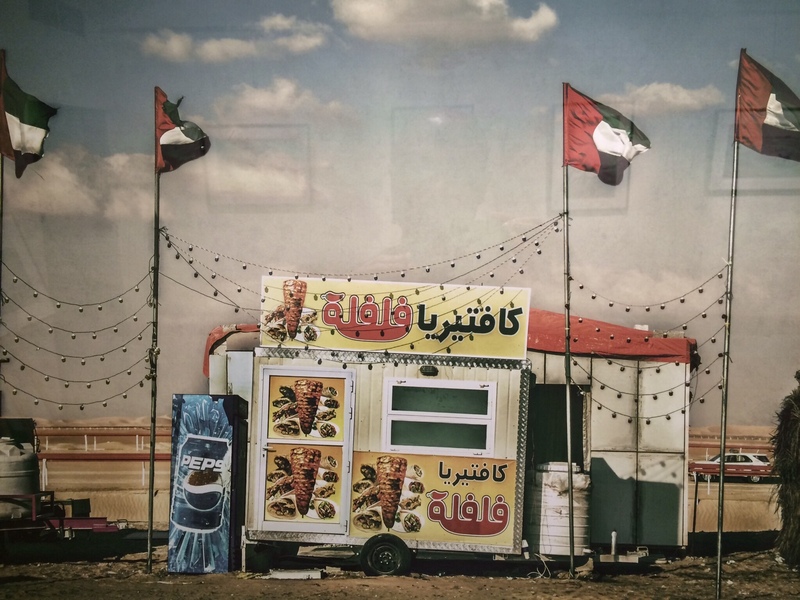 Emily Gordon’s loud ‘Abu Dhabi Corniche’ (see above) was also eye-catching and, I suspect, slightly more vibrant than the real thing. A lovely little organice cafe attached to the Modern Art Gallery. Aside from the cringe-worthy cover versions of 1970s disco funk on loop (which was played quietly enough not to be intrusive), everything was great. THe food was lovely (I enjoyed a mushroom quiche, plus “crumbled calamari”), battered suitcases adorned the walls, and the seating included blow-up armchairs in garish designs. A place I could have stayed for a few hours had the gallery not be closing. TripAdvisor gives this a 4.5/5 rating, but markontour says it is a place to avoid. Bad music played loud. Crap beers. No atmosphere. If you want to go to a pub called The Coopers go to Burton instead. I suspect that I might not like this artificial beach stretch during the day, but on a winter’s evening with not so many people around it was a great place to wander for an hour or so. Down this neck of the woods there are pavements, boardwalks, pedestrian crossings and even cycle lanes, although the only cyclist I saw wasn’t using it. The Hilton beach-side shisha bar was relaxing without too many people around and, despite being surrounded by glittering skyscrapers, the stars still made an appearance up above. A breathtakingly beautiful and the subject of its own little markontour blog.